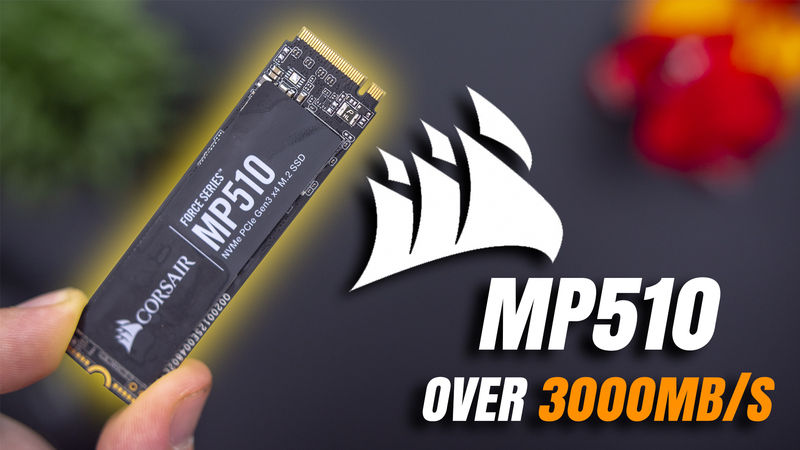 Recently Corsair announced their new accessor to the MP500 range of NVME SSDs the Force MP510. The new SSDs delivers faster speeds, higher life cycle and at the same price as the previous MP500 SSDs. The MP510 SSDs come out in a few different sizes that also deliver different performance. You get a 240GB, 480, 960 and 1920GB models with ranging from $75 or R1400 to $537 or R4900 for the 1920GB model. All of them available on RebelTech here in South Africa. So let’s get into how the new MP510 ssds perform right after this. So starting off The New MP510 range utilizes Toshiba’s 64L 3D TLC NAND flash and a Phison PS5012-E12 SSD controller that adds a few new tech built in. Like StrongECC, SmartRefesh, and SmartFlush that will help monitor, refresh and reconstruct data for better stability and reliability. As for reliability the new range comes with a nice 5 year warranty and a life cycle ranging from 400 to 3120 Terabytes written depending on the size. Now getting into how the MP510 performed the sample I have here is the 960GB model. I am going to compare it to my 500GB Samsung 960 Evo NVMe SSD and some cases the Corsairs NX500. In ATTO the MP510 had quite stable read and writes through the Transfer Sizes whereas the 960 Evo did fluctuate a lot and and mas quite a bit slower especially in writes. As for the Steam backup file when making a direct copy on the same drive the MP510 did it in 1min 21 sec and the 960 Evo did it in 1min 35 seconds. So the Corsair was faster but I saw a lot more inconsistency with the copy, the speed kept going up and down whereas with the samsung it started off really quick but then dropped a lot but too a stable 400mbps. I also copied the same files from the one drive to the other and saw that when copying from the MP510 to the 960 again it started great but ran into the 960s buffer getting ful and slowing down to around 600mbps. As for the 960 to the MP510 i saw a faster and more consistent 1GBPS copy speed. So in conclusion these new MP510 SSDs from Corsair are truly speed machines. This kinda makes me disappointed that I bought the 960 Evo a while back. Now I know there is a new 970 Samsung Evo out but even when just looking at the rated speeds the new Corsair MP510 ssds out perform the Samsungs. From all the benchmarks we can see that the MP510 does not run into a buffer limit and stays at high speeds. I didn’t really do windows boot speed test because these days with NVMe SSDs its just so damn quick.